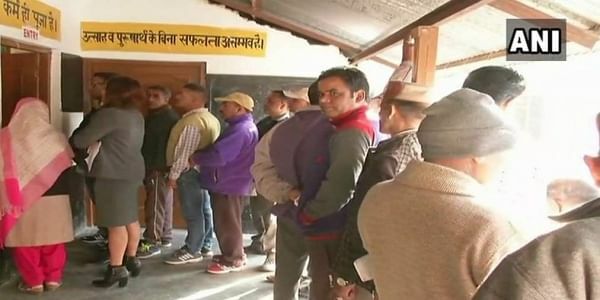 Over 50 lakh voters from across the state were exercising their franchise in the single-phase poll that began at 8 a.m. and will continue till 5 p.m.
SHIMLA: More than 10 percent polling was recorded in two hours for the 68-seat Himachal Pradesh assembly elections that began amid tight security on Thursday, an election official said here. "Despite the cold and minor hiccups like electronic voting machines developing snags at some places, there was no report of any delay in starting the poll process," an electoral officer told IANS. A total of 337 candidates, 19 of them women, are in the fray. There are 112 Independent candidates. The main contest is between the ruling Congress and the Bharatiya Janata Party (BJP). The Congress has projected incumbent Chief Minister Virbhadra Singh as its chief ministerial candidate, while Prem Kumar Dhumal is the BJP's. Both are contesting the elections. Both Singh and Dhumal cast their votes along with family members at their hometowns Rampur and Samirpur, respectively. A total of 50.25 lakh electorate, including 19 lakh women and 14 transgenders, will decide the fate of the candidates. The Hikkim polling station in Lahaul-Spiti district, country's highest polling booth at 14,567 ft, has 194 voters. While Kaa village in Kinnaur has the lowest number of voters at six. Voting began on a dull note, with below five percent polling in the first hour. By 10 a.m., it rose to 13 percent. Women in the rural areas turned out in large numbers. The Congress and the BJP have fielded candidates on all 68 seats, while the Bahujan Samaj Party and the Communist Party of India (Marxist) have fielded 42 and 14 candidates, respectively. The vote count will be held on December 18 along with those of Gujarat.